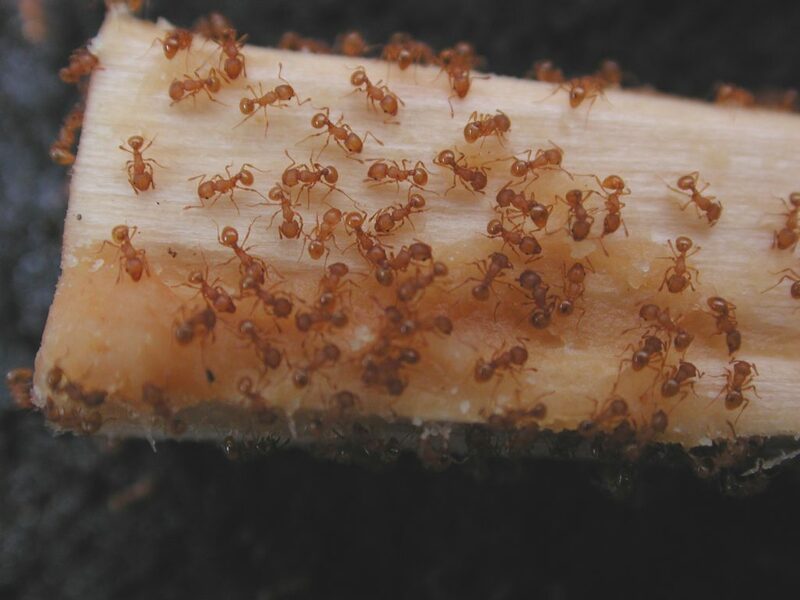 The Hawai’i Department of Agriculture confirmed a second infestation of little fire ants in a neighborhood in ʻĀhuimanu after a resident reported stinging ants. The department conducted surveys of the area and a nearby home of a relative and detected two infestation sites around ʻĀhuimanu Road. The main site involves 13 properties and the other site involves five properties, totaling about three acres, including 15-meter buffer zones around each site. HDOA and the Hawai’i Ant Lab treated the area last Thursday. 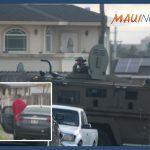 Crews also conducted the second treatment of a Kāne’ohe neighborhood where LFA was detected in December. HDOA plant pest control specialists from Hawai’i Island were brought in to help conduct the treatments. In late January, an ʻĀhuimanu resident reported stinging ants and HDOA entomologists confirmed that they were LFA. Crews conducted multiple surveys of the neighborhood to determine the boundaries of the two infestations. The infestations in Kāne’ohe and ‘Āhuimanu do not appear to be related. A few weeks ago, LFA was also confirmed on a plant that was purchased at the Punahou Carnival in early February. Those who purchased plants at the carnival are being urged to test their plants for LFA. So far, no LFA have been reported on any other plants sold at the carnival. Suspected LFA should be reported to HDOA’s Plant Pest Control Branch at (808) 973-9538. 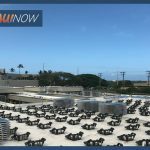 The Kāneʻohe infestation zone includes a total of 11 properties covering about two acres around Alokahi St. That area was treated last Thursday for the second time following a treatment plan developed by HAL researchers. The treatment involves the application of several types of pesticides and bait formulas in six-week intervals for a total of at least eight treatments. The department will continue to monitor these areas for several years following the treatments. In 2015, LFA was successfully eradicated in a six-acre infestation site in Mililani Mauka using the same treatment protocol being used in the two Windward Oʻahu infestation sites. LFA was first discovered on Hawai’i Island in 1999. Since then, the population on the island has become widespread. After the initial detection, HAL and HDOA have developed a treatment strategy to prevent the spread of LFA to other islands. HDOA and partner agencies, including the Invasive Species Committees on O’ahu, Kaua’i, and Maui County and the Coordinating Group on Alien Pest Species have been asking residents on O’ahu, Kaua’i and Maui County to survey their properties for LFA. Residents can survey their properties by applying peanut butter on a chopstick and leaving it in several areas for about one hour. Any ants collected should be put in a sealable plastic bag, placed in the freezer for at least 24 hours, and dropped off or mailed to any HDOA office. An informational flyer may be downloaded online. In addition, the Department of Land and Natural Resources has created a three-minute video called “How to Test for LFA,” which shows the step-by-step procedure for testing for LFA. The video is available online. Originally from Central and South America, LFA is considered among the world’s worst invasive species. 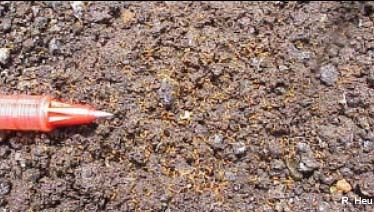 LFA are tiny, pale orange ants measuring 1/16th inch long. 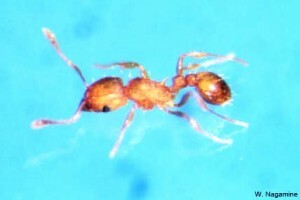 LFA move slowly, unlike the tropical fire ant, which is established in Hawai’i. LFA can produce painful stings, large red welts, and may cause blindness in pets. They can build up very large colonies on the ground, in trees, and other vegetation, as well as buildings and homes. They are also capable of completely overrunning a property. Suspected invasive species should be reported to the state’s toll-free pest hotline at (808) 643-7378.